After making our toilet paper roll menorah I realized how much Carter loved doing activities with paint, so I wanted t come up with more! 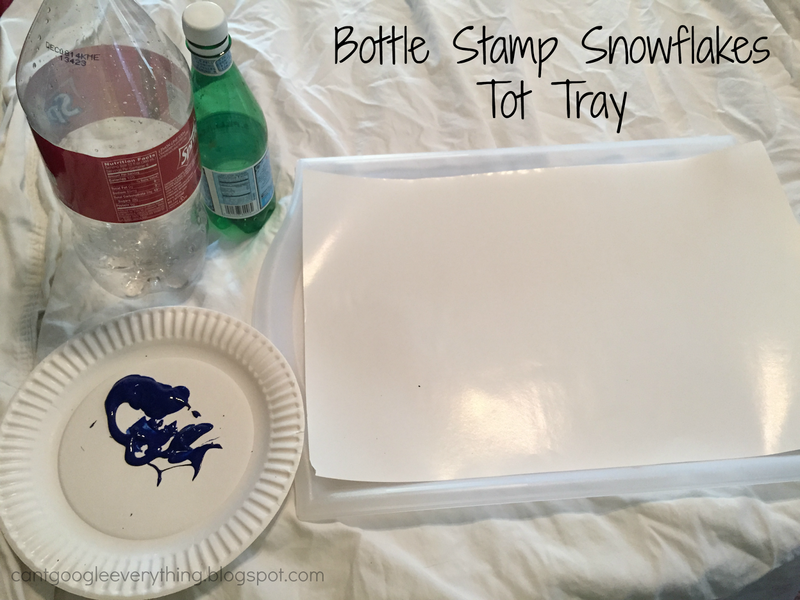 I thought the bottom of soda or water bottles would be the perfect “stamp” to create some snowflakes for winter! This activity really couldn’t be any easier to set up! You just need paper, paint, paper plates to hold the paint and some empty plastic bottles! I would also recommend covering your surface with a sheet or plastic tablecloth! As usual I set everything out for Carter on his “activity tray,” which shows him that we are about to do some sort of activity. I use washable poster paint. After showing him what to do with one example stamp, he was off and running! 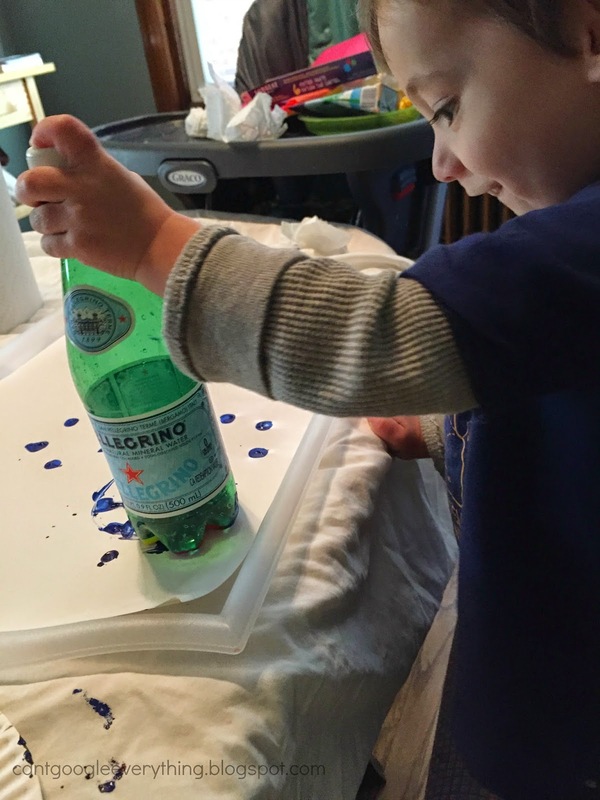 He enjoyed stamping the bottles and saying “boop boop” everytime he stamped down on the paper. I planned to just use blue paint, but Carter wanted to use all the colors so we went for it! After all, no snowflake is alike anyways, right?! We discovered that the water bottle made a much better snowflake shape than the soda bottle, which just made dots. You can experiment with different kinds of bottle sizes for various types of snowflakes. 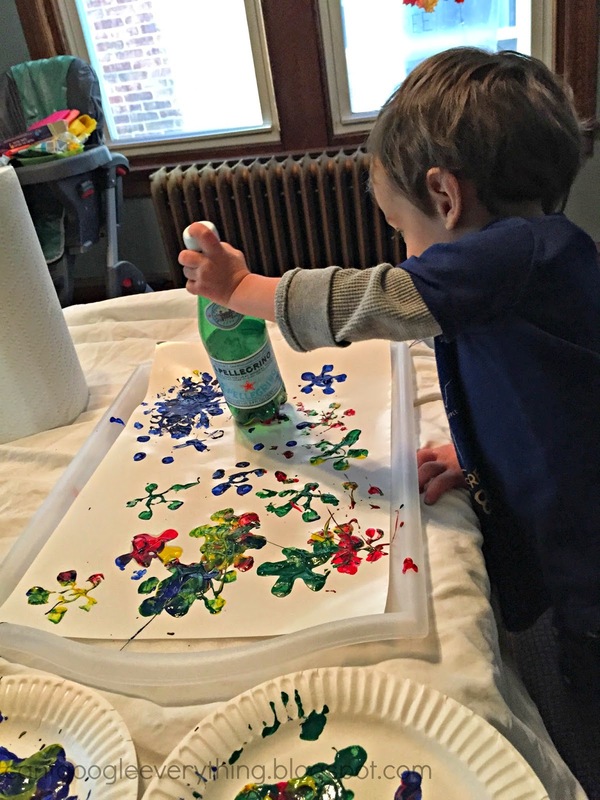 This activity was pretty easy to clean up, too, assuming your kids don’t turn over the paint or throw it all over! I just hung up the painting, threw out the paper plates holding the paint and rinsed the bottles off before tossing them in the recycling bin! Easy! He is adorable and looks like he is having so much fun! Great craft! And looks like it was easy clean up too! Super cute craft! My little guy is only one and a half, but I think he might like hitting the bottle on the table! Pinning!